Claire takes a quick break to give Diva a scratch behind the ears during Paws to Read at Mentor Public Library. 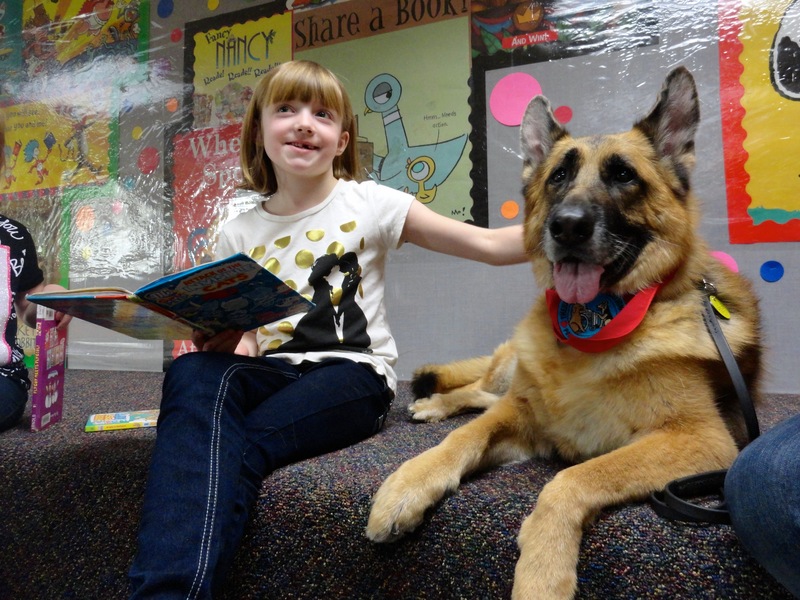 Books and bulldogs, pages and pups—Paws to Read is back! 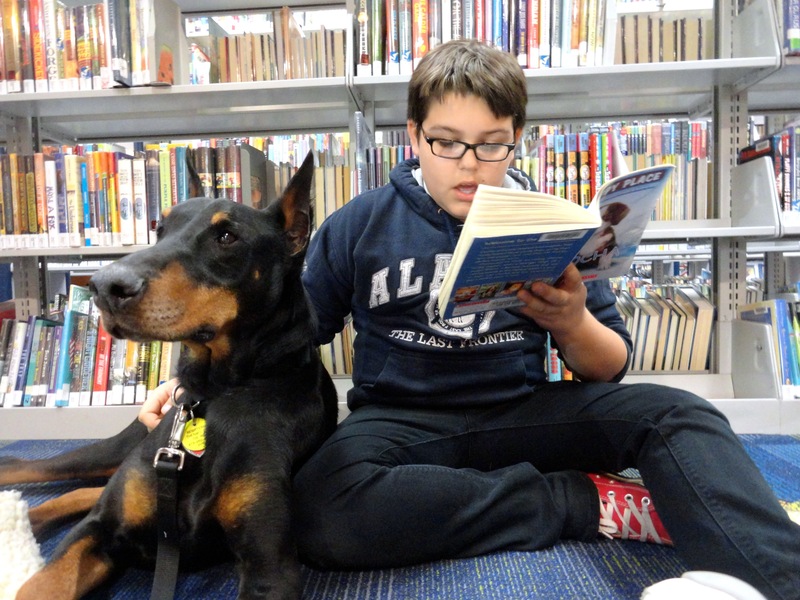 Every month, we pair young readers (between the ages of six and 12 years old) with therapy dogs, who listen to the children as they read. The dogs make an ideal audience—supportive and adorable—and all they ask for in return is the occasional belly rub. The program helps build the child’s confidence and makes reading fun for them. If your child can read independently but doesn’t like to do it in front of other people, you might try signing them up for Paws to Read. The program works well for dog lovers, but it’s also helped some kids who are scared of dogs get over their phobia. Colin demonstrates his ambidextrousness. He can read with one hand and pet Captain Jack Sparrow with the other. Our next Paws to Read program will be Wednesday, May 18, at our Main Branch. There will be two 30-minute sessions; one beginning at 6:30 p.m., the next at 7 p.m. Registration begins May 4. We only have so many therapy dogs; so, unfortunately, there’s a limit on how many kids can participate each month. Also, spots sometimes fill up quickly, so contact the children’s department at Mentor Public Library soon if you think you child would enjoy Paws to Read. For more information on Paws to Read and other children’s programs at Mentor Public Library, call (440) 255-8811 ext. 221 or visit our online event calendar. 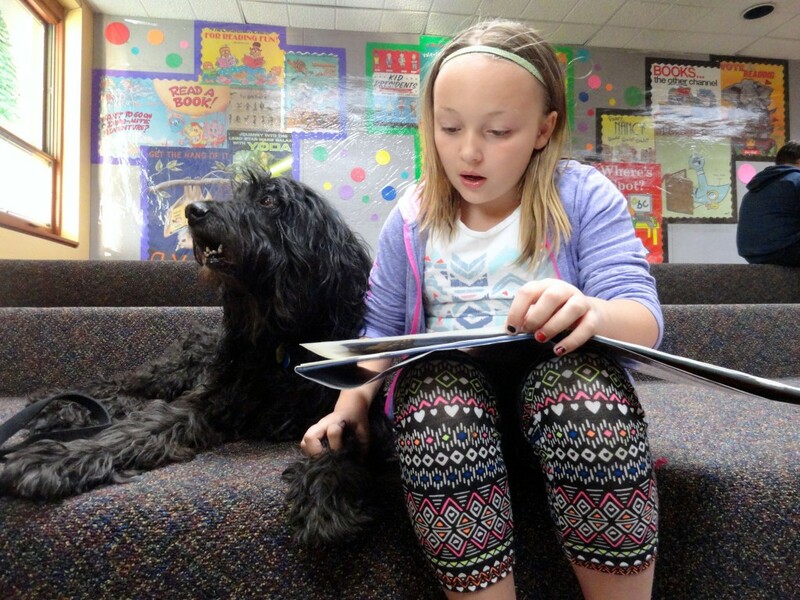 Makenna strokes Kody’s fur while they share a book. For more photos from Paws to Read, visit Mentor Public Library’s Facebook page. This entry was posted in Uncategorized and tagged Mentor Public Library, Paws to Read. Bookmark the permalink.